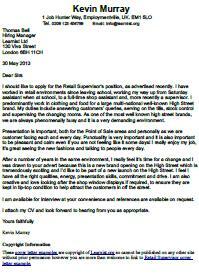 Cover letter example for a Retail Supervisor job in the UK. Amend as suitable and start writing your cover letter to apply for jobs. I should like to apply for the Retail Supervisor’s position, as advertised recently. I have worked in retail environments since leaving school, working my way up from Saturday assistant when at school, to a full-time shop assistant and, more recently a supervisor. I predominantly work in clothing and food for a large multi-national well-known High Street brand. My duties include answering customers’ queries, serving on the tills, stock control and supervising the changing rooms. As one of the most well known high street brands, we are always phenomenally busy and it is a very demanding environment. Presentation is important, both for the Point of Sale areas and personally as we are customer facing each and every day. Punctuality is very important and it is also important to be pleasant and calm even if you are not feeling like it some days! I really enjoy my job, it’s great seeing the new fashions and talking to people every day. After a number of years in the same environment, I really feel it’s time for a change and I was drawn to your advert because this is a new brand opening on the High Street which is tremendously exciting and I’d like to be part of a new launch on the High Street. I feel I have all the right qualities, energy, presentation skills, commitment and drive. I am also creative and love looking after the shop window displays if required, to ensure they are kept in tip-top condition to help attract the customers in off the street. View another Retail Supervisor cover letter example!